The key to successful free-ranging is good land management. This applies to the nature of the land itself, the degree of shelter it offers, how it is fenced to deter predators and how pasture is managed and maintained. Traditional free-rangers have always known this, but some of the first large-scale commercial enterprises in the 1980s failed to appreciate it, thinking that the house was the only thing that mattered. They ended up with houses so large and badly designed that some birds never found their way out. Those that did stayed in the immediate vicinity of the building because no provision had been made for shelter in the pasture, and the area immediately around the houses became devoid of vegetation. Complaints from welfare organisations and consumers that this was not real free-ranging soon had its effect, and new standards were introduced to improve conditions. There is still some way to go, however, in convincing some producers that the grazing area matters. 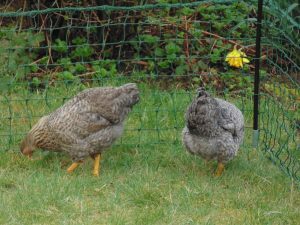 The next article The Nature of the Land for Free Range Poultry discusses types of land, drainage and the importance of rotation to maintaining pasture quality and reducing parasite and worm loadings. Widely recognised as the definitive guide to modern free-range poultry management, Free Range Poultry is a practical and comprehensive guide that is up to date with legislation and research findings. The articles listed at the end on land management in free-range poultry systems are extracted from the book.